Patrick White is Australia’s only recipient of the Nobel Prize for Literature, which he received in 1973. At that time his body of work included nine novels, one short story collection, many poems and several plays. He went on to write very many more works (a total of 12 novels, three short story collections and eight plays) before his death, in 1990, aged 78. He is widely regarded as one of the most important English-language novelists of the 20th century. I have read three of his books — The Tree of Man, The Vivisector and The Solid Mandala (the latter two have been reviewed on this site) — and have found them enjoyable and rewarding, if somewhat challenging. I have several more of his novels in my TBR, so when Tony, who blogs at Messenger’s Booker, suggested a read along, I put up my hand to take part. 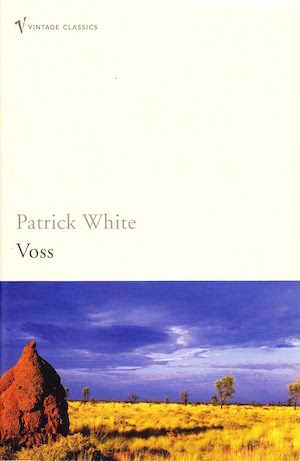 The book we will be reading is White’s Voss, which won the inaugural Miles Franklin Literary Award in 1957. The British critic Robert McCrum, who named it on The Guardian’s 100 Best Novels, describes it as a “monumental novel” with “an archetypal power”. The read along runs throughout March and several of us have agreed to do it — Stu, who blogs at Winston’s Dad; Grant, who blogs at 1st Reading; and me — but you are welcome to join in. Indeed, the more the merrier. You don’t need a blog, you don’t need to write a review; just read along with us and join in any discussions on our blogs or on Twitter. You can read more about the initiative at Tony’s blog. I will make sure to read your treatise when I finish reading the book! *chuckle* You will be too exhausted to contemplate it. But it does get an inordinate number of hits, obviously from students ‘doing’ it at school or university. I’ve been wanting to reread Voss for some time. I read it in grade 11 and loved it. The Tree of Man was a grade 12 work but didn’t like that as much – I think it was a more difficult read. I read most of his others as they were released. I just looked at some of the hardback copies I have and they were printed in Britain! When did they stop that? Anyway, will join you on this Read Along. Be great to have you along, Glenda. I did an Australian literature MOOC last year and one of the books featured was Voss. I have since acquired a copy. It sounds like a good time to read it. The MOOC sounds interesting… would love to do one of those. Be great if you could join in… it sounds like an interesting book. The MOOC was great – it was run by the Uni of WA but I don’t think it’s on offer anymore. You can do it for free or you can pay for a certificate – they are not very expensive. I’ve done quite a few, mostly for professional development, but a couple just for fun. That’s good to know… I’ve moved into a new industry so keen to do some stuff for professional reasons but I’d do anything literary for the fun of it. 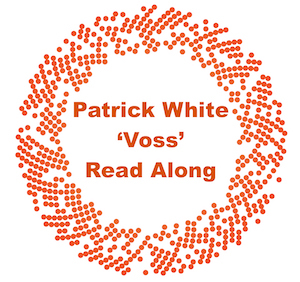 I love love love Voss – did it for Year 12 and got right into it. I wrote a little about a Voss Journey event on my blog a few years ago. I’d love to join in but I think my commitments are too much at present. (I love The solid mandala too – one of the few books, besides Austen, that I’ve read twice). Glenda did it in Year 12 too (see above!) Good to hear your enthusiasm for it; makes me more keen to get stuck in. I, too, loved the Solid Mandala… such an intriguing look at twins! Patrick White sounds like an author I should get to know! And the premise of Voss sounds promising. I’ll follow along, even if I don’t read along. Have fun! Don’t worry, Stu. I haven’t started yet: I have 3 books on the go I need to finish first. I wanted to do this, even going so far as to buy a copy, but the Man Booker International Prize long list got in the way. Not all is lost; I will save it for the summer, and I’m glad to know even more about it from your post. It’s quite a dense read; you really need to devote large chunks of time to it. I’ve got distracted by Stella Prize shortlist reading but hope to get back to it this weekend: I’ve got about 100 pages left. Don’t feel like a criminal: the way you feel about a book is subjective and if we all liked the same books the world would be a very dull place! Patrick White isn’t for everyone.